Microbiologist Dr. Tyler Kokjohn commented on the latest incredible claims put forth by Dr. Steven Greer, suggesting Greer's lack of verifiable details make his assertions all but impossible to accept at face value. Greer continued his ongoing public discussion concerning an alleged dead extraterrestrial being, this time enhancing the storyline with alleged world authorities involved in its analysis. Kokjohn countered by pointing out Greer's tale is virtually void of any established scientific protocol whatsoever, and informed this writer that supposing any such authorities would jeopardize the validity of such an unprecedented discovery is an insult to intelligence. Kokjohn further pointed out that producing X-rays and computed tomography (CT) scans, as Greer claimed were obtained, requires certain authorization and specific equipment. Only “a damn fool or an utter ignoramus,” Kokjohn wrote on UFO UpDates List, would attempt such procedures without conditions of full biological containment, even if they received clearance to use the equipment under such extraordinary circumstances. “Who wants to get their CT scan after ET was in there?” Kokjohn asked. Funding scientific research is always a gamble. If investigators are truly traversing uncharted territory, predicting results and anticipating experimental pitfalls may be almost impossible. How does one maximize the odds an investment in a research project will produce tangible results? Use the 3 Ds - Disclosure and due diligence. Before any money is allocated, scientists perform a detailed due diligence assessment of the investigator’s skills, the equipment available and work plans. Investigators with a strong track record of experience and publications in the areas they propose to explore, who have the necessary facilities and equipment available for their use and who put forth a clear plan of work will be favored heavily. Investigators are expected to disclose preliminary results that bolster the central research hypothesis and provide all information that will enable their proposals to be evaluated fully. In addition, investigators must stipulate that the research will be conducted following all applicable guidelines and regulations for biosafety and work with human subjects. It is very simple, if you want money, it is up to you to prove you can actually run something besides your mouth and do it safely. Dr. Greer has offered a pale imitation of the evaluative process used by scientists. He asserts recognized experts are collaborators, he (or someone) holds exciting preliminary data and research is proceeding apace. All good components of strong research, the problem is he does half a job and just quits right there. Failing to disclose the qualifications of key investigators, providing a work plan to judge or allowing not even so much as a glimpse at supporting data stymies any hope for informed, unbiased assessments completely. For a guy who carved a career niche out of demands for disclosure, he appears remarkably reluctant to either acquire full information from his collaborators or provide a full story to the public. To help those wondering whether to contribute money to his effort, Dr. Greer could disclose some of the data and allow persons unaffiliated with the project or documentary to assess the value of his results thus far. How about revealing the names and qualifications of your expert collaborators? Since they are part of a team that is working on what would be the greatest discovery of our age, wouldn’t they want to have their names front and center? What is their expert opinion of the data? Let’s see the CT data and with it the particulars regarding the equipment that produced the scans and the computational parameters employed for image acquisition. While you are at it, how about the name of the institution supporting this work – you know, the organization that allowed the use of its CT facilities, computers and technicians to acquire and analyze the images. Did anyone (like an Institutional Review Board or Biosafety Committee) express concerns about putting a dead unknown entity inside a specialized piece of rather expensive equipment? Better yet, did anyone ask about how work with a possible entity unknown to science would be conducted in a safe and responsible manner? Those are pretty easy questions, ones any scientist doing such a project would be able to answer – before any work commenced. Will the doctor follow his own prescription? 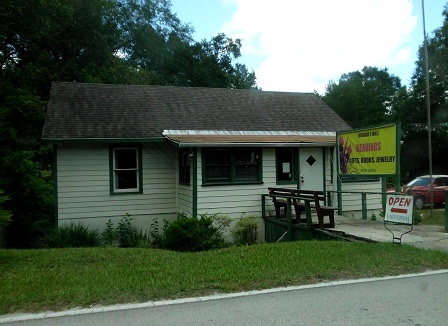 A small town located between Orlando and Daytona Beach has long been considered a virtual shrine to all that goes bump in the night. It is home to no more than a few dozen residents, at least officially, and it does not so much as have a single traffic light. The town does, however, have something called a spiritualist camp. It also has an 85-year-old hotel where you can participate in an overnight ghost investigation, hang out at a witches' ball or have an appointment with psychics who channel spirits. Cassadaga, Fla., is all that is woo. Some say you have not fully experienced the paranormal genre until you have delved into the community and its steady stream of interesting visitors. Let us delve. 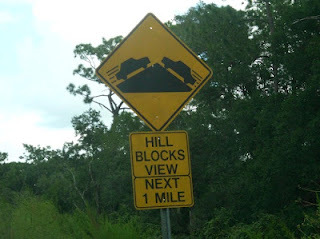 I exited the busy interstate highway and had to take winding rural roads the rest of the way. 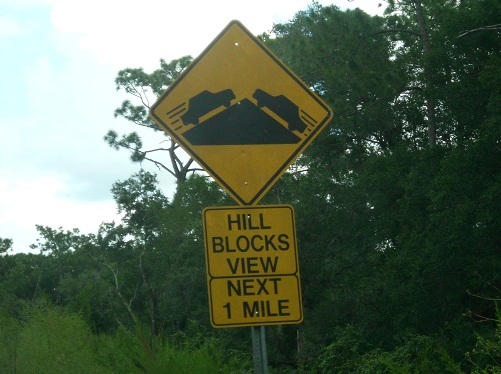 I passed a sign that warned drivers of obstructed view. Approaching the community I was a bit intrigued by roads that became progressively more narrow and covered by foliage, and I later discovered some side streets reduced to little more than make shift paths. I will allow the reader to decide what metaphoric value might be assigned to such landscape characteristics as make up Cassadaga. Visitors will initially note the many old wood frame houses where shingles hang, announcing the presence of psychic mediums inside. 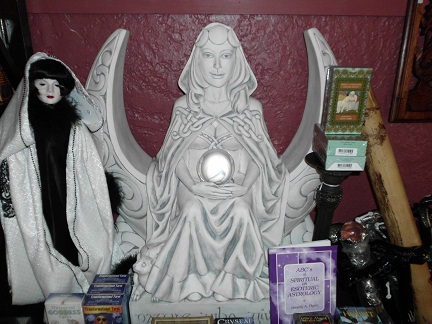 Resident psychics perform readings and various metaphysical services for paying customers who in some cases become regulars. 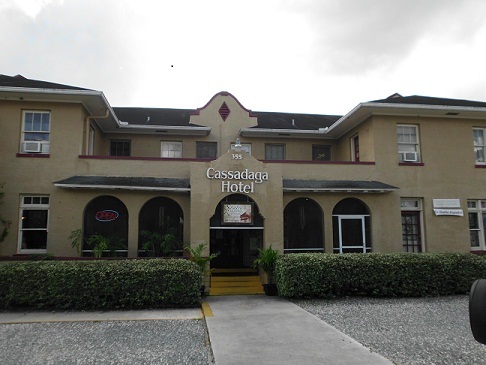 Cassadaga and its alternative evolution are apparently results of the life and times of George Colby, a New Yorker who arrived on the then yet to be formed scene around 1875. Colby seemed to have believed his spirit guide, Seneca, led him to the Florida wilderness where he settled. Colby went on to be instrumental in the 1894 incorporation of the Cassadaga Spiritualist Camp Meeting Association, a 50-plus acre site that is home to mediums and like-minded worshipers. 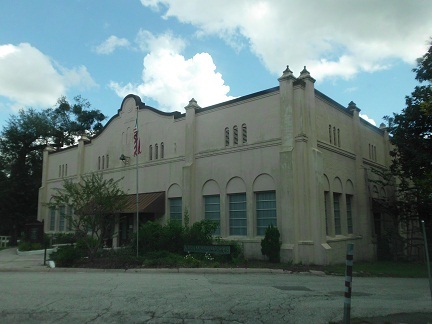 It now holds the distinction of being the oldest active religious community in the Southeastern U.S. 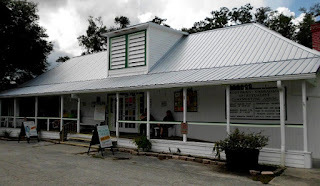 The organization houses a book store, gift shop and welcome center, where information may be obtained about such activities as historical tours. You can also find details about meditation gatherings, Reiki healing circles and classes designed to develop your abilities as a medium. 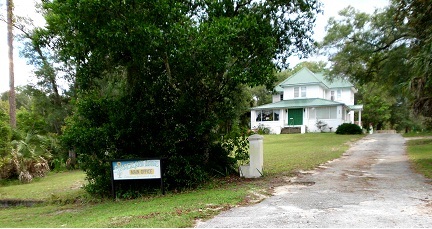 You might choose to strike up a conversation with visitors sitting on the porch of the center, where favorite paranormal-themed movies and similar such topics are discussed. I took a leisurely walk around Cassadaga, interacting with those at shops and the several public areas designated, more or less, for hanging out. I found some of the residents and regulars to be less open to my inquiries than others. 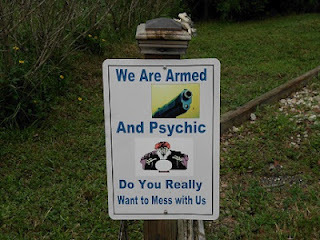 Suffice it to say they have met their share of intrusive antagonists. As a result, in some cases they tend to avert from writers with cameras, as might be reasonably expected. While we could consider the points and counterpoints of such social issues as whether one would be justified in resenting attention received for practicing the 'craft, let us leave such considerations for another time. 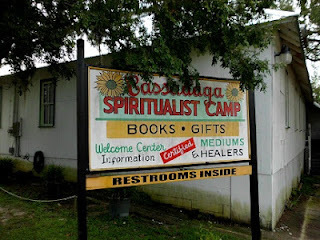 I would rather tell you about my stop at the Cassadaga Hotel. 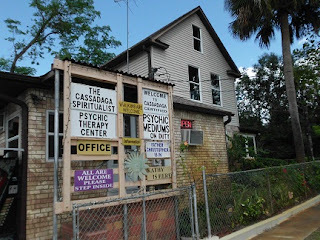 The Cassadaga Hotel and Psychic Center, established 1927, was most intriguing. 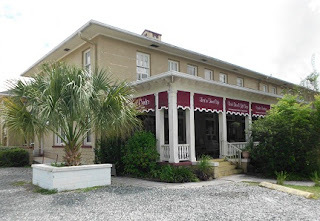 Dubbed the metaphysical center of the south, the hotel offers various packages and rates currently starting at $55 per night for a double occupancy room. I spent several minutes on multiple occasions browsing the many signs and printed materials located in the lobby. There is much to read about area events and activities, such as those conducted by American Ghost Adventures, or AGA. AGA leads ghost investigations and tours throughout the Orlando and surrounding area. I found some of their scheduled events particularly interesting, including an upcoming overnight investigation at the Cassadaga Hotel. Tickets are $50 and we may very well explore such events much further in future articles. 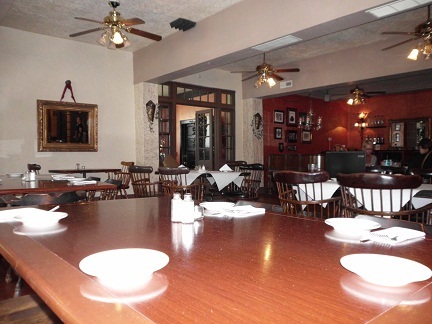 The hotel is home to Sinatra's L'Aldila Ristorante, where employees were very friendly and accommodating. Photos from Frankie's day hang on a wall at the end of a bar where drinks, coffee and conversation flow. I tried a reasonably priced Sicilian beef sandwich for lunch which convinced me I would like to return for dinner. Specials, such as a date night dinner for two, are available, as well as an apparently popular Sunday brunch featuring live piano music. Sinatra's will be hosting a witches' ball Sat., Oct. 20. The event will have a dragon theme and advance tickets are $30. 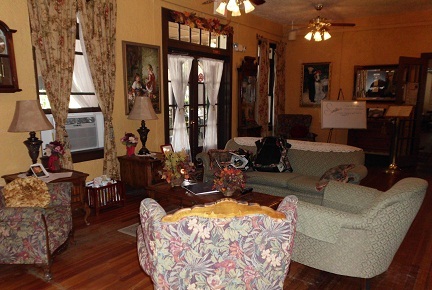 Special packages are available that include a hotel room and Sunday brunch. Call 386-228-2323 for details. The Cassadaga Hotel hosts several mediums who offer services such as readings, seances and past life regression. Prices currently start at 55 bucks for a 45-minute reading. I scheduled and paid for a reading in the hotel gift shop. I was instructed to meet Mary Hayes later in the lobby at my appointment time. The interaction turned out to far and away be the most interesting aspect of my visit. I stood in the lobby of the Cassadaga Hotel, once again reading about the many local activities. Mary Hayes descended some stairs. She greeted me with a kind smile and warm handshake. I began to appreciate Mary's impressive ability to create a positive first impression. Moreover, I was beginning to look forward to spending some time in the company of someone I interpreted to understand that my perspectives of their chosen activities said much more about me than them. I have found such understandings to commonly be reserved for the emotionally intelligent and I was therefore becoming increasingly interested in observing more. Mary offered me a bottled water, which I accepted, we took seats in the small yet comfortably furnished room and she proceeded to explain what she does. 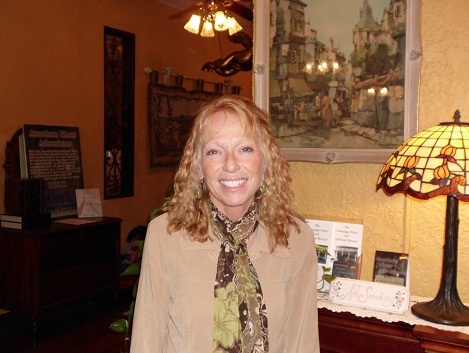 A self-described intuitive counselor, Mary indicated she considers herself fortunate to provide services we might compare to those of a life coach. 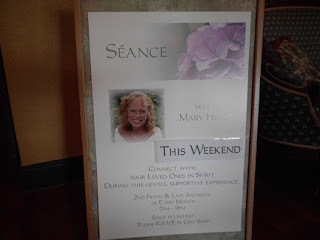 Mary Hayes then explained she is the voice of The Channel, a union of enlightened beings. I felt no desire to challenge her statements, although I did repeat them for clarification. Actually, I intended to be respectful else not bother wasting either of our time. 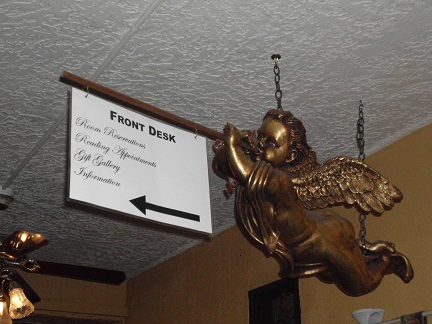 After all, what did I expect people to be talking about on the second floor of the Cassadaga Hotel? Mary explained that enlightened beings could speak through her and provide what is termed a color reading of me if I was in agreement. I empowered her to guide me as she thought best. She then further explained how the enlightened beings would tell me what my colors represented, and afterward they would be pleased to entertain questions. Mary was going to close her eyes during the forthcoming reading, but she instructed me to continue watching her and absorb the experience as fully as possible. She confirmed that I understood what was taking place, as she periodically checked throughout our time together, and asked for my approval to proceed. Closing her eyes, the woman then made a couple of what I interpreted to be grounding gestures. At that point, the sound of Mary's voice changed as The Channel greeted me. Initial statements were exchanged and not long afterward my colors were being described. The descriptions represented characteristics of various states of personal being and development. We proceeded during the next several minutes to discuss life, love and similar matters of heart and soul. I found myself inspired to use the experience to conduct some introspection, contemplating things I was observing about myself during the interaction. As for Mary, she demonstrated an abundance of empathy and loving kindness, whatever their source. She also happened to have a pretty entertaining sense of humor that enhanced her refreshingly pleasant disposition. Mary stood out from the crowd, even when surrounded by those who stand out from crowds. I thought this to be the case due more to her demeanor and interpersonal skills than her preferred non-traditional activities, much as the latter may interestingly contribute to the former. If it works for Mary and her following, more power to them. If Mary Hayes is effectively finding a way to do more good than harm while assisting others in coming to terms with their demons, either literal or metaphoric, I would be more inclined to support such efforts than not. I suspect the devil is much more in the details than the Tarot. Subscribe to The UFO Trail and follow Jack Brewer on Examiner, where this article was originally posted. "You always have to ask 'how do we really know that?' Sometimes the answer is a disappointing: 'we really don't.' That is the BEGINNING of progress, not the end." "Any time scientists withhold information and ask you to trust them, it is a giant red flag." "If access is granted to the evidence, it will not take long to establish facts. We can debate hear-say forever." "Our memories are constructive. They're reconstructive. Memory works... like a Wikipedia page: you can go in there and change it, but so can other people." "Here’s how I see it: Empathy is the ability to respect and maybe even understand another’s point of view, revealing larger truths about ourselves and others. Exploitation is the use of another’s experience for personal gain. Empathy requires self-awareness. Exploitation is marked by self-interest. Empathy is about deepening connections. Exploitation, about filling one’s pockets, literal or figurative." "The recordings of my hypnosis sessions are full of [David Jacobs] regaling me at length about his other subjects' testimonies." "Probably the most honest book on UFO alien abduction I've ever seen..."
"Must-read for anyone interested in the alien abduction phenomenon"
"Brewer has done the hard work of tracking such stories to their lairs"
"The heinous practices pointed out in this carefully organized, well-indexed study deserve to be widely exposed"
"Important and complex cases are presented in a readable format"
"One of the most important books on the UFO subject in recent years"
I encourage critical thinking and healthy skepticism balanced with keeping an open mind.